Apple has said customers who lose one of the new wireless Airpod earphones will be charged £65 for a replacement. The devices went on sale via Apple's website this week and a pair costs £159 in the UK. They are sold with a charging case and connect to Apple devices such as iPhones and Macs via Bluetooth. One tech analyst said the Airpods would be "easier to lose" than conventional, wired earphones but pointed out that the design also had some advantages. Customers will also be charged £65 to replace a lost charging case. It costs £45 to service the battery in a single Airpod or the charging case itself. It is not surprising that replacing a lost product would incur a charge, noted IHS Technology analyst Ian Fogg. "What's striking I think about this is more that, because the Airpod is so small and doesn't have a cable, it's going to be easier to lose," he told the BBC. 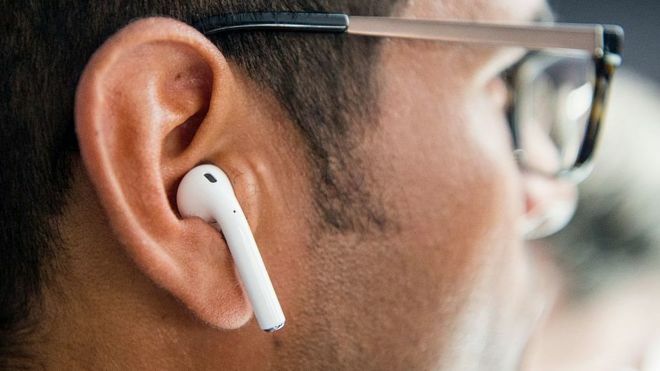 He added that one benefit of wireless, miniaturised devices like the Airpods was the fact that connecting wires would not snag on clothing, for example. But it might be possible to develop features for wireless earphones in the future that would help users find a lost Airpod and avoid having to pay for a replacement. "Apple could have a 'find-my-Airpod' feature," suggested Mr Fogg. Other companies making wireless earphones also have replacement charges. For example, Bragi's The Dash earbuds - which retail for $299 (£240) as a pair in the US - can be replaced for $129 each.